Members of the VISION OVNI team in Concordia – Vicky Zeigler and Martin Bertochi – were informed of a sighting that was taking place in the vicinity of Yuquerí Chico, Department of Concordia. The witnesses – members of the Guilme family – phoned the researchers in a state of alarm and astonishment at what they were witnessing over their field on the outskirts of the city. Upon reaching the site they found the family in a highly emotional state as a result of the sighting, and who were still unable to explain what they had seen for a number of minutes. Time the Sighting Occurred: 20:30 hrs. and 21:15 hrs. Vicky Zeigler reports that a friend told her that a light was flying overhead, changing colors from red to blue to green to turquoise. It made sudden moves, rising and descending time and again. This happened around 20:30 hours. At 21:15 hours the friend said that there were now 2 lights with the same characteristics, and that on this instance, both lights swung around in the sky to return to their original position. However, what startled the researchers most was that the family had managed to take photographs of what they had seen, reflecting exactly what they had described both in shape and colors. We share with you the material obtained by Vicky and Martin. We await further information, as we were advised that a multicolored, cross-shaped light was seen in Gualeguychú. 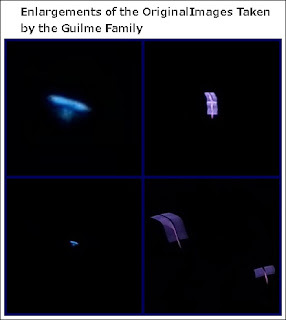 It matches what was seen and photographed by the Guilme family. AN INVESTIGATION BY VISION OVNI.